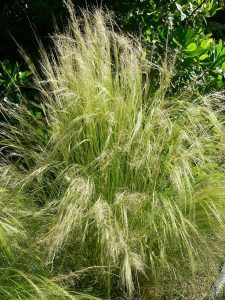 One of the most popular ornamental grasses used today is the light, fine textured Mexican Feather Grass. This grass will grow about two feet tall, and under most conditions it does not have to be re planted year after year. As a perennial it produces green foliage during the cooler months and goes dormant in periods of heat, turning brown before re-seeding upon the arrival of cooler temperatures. The blades of this plant sway in the breeze and resemble the soft image of water cascading from a fountain. Mexican Feather Grass is widely used in both home and business landscapes. A main reason is its tolerance to dry, drought conditions. It will primarily get by on rainfall alone. Easy to grow, it requires little maintenance. It is great planted as a ground cover for a large open area, and is excellent when planted on steep slopes, where it serves as a great control for soil erosion. Or you may wish to use it to border along walkways or within a rock garden. As a container, use Mexican Feather Grass as the main “thriller” component, due to its tall upright growth habit. This plant needs full sun and is not tolerant of shade. 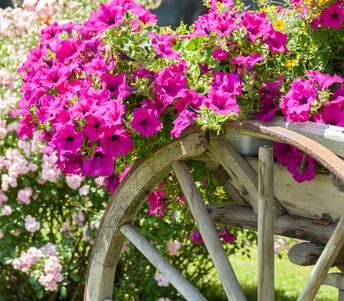 It needs to be planted in soil that drains very well, as excess moisture in cooler, wetter months may kill it. If grown in a colder zone than recommended it will likely need to be treated as an annual and replanted each year. Water: Low after establishment. It will survive primarily on rainwater. Soil: Well drained soil that is amended with organic matter. Excess winter moisture may kill it.